It’s not all fun and games in Papeete. Staying at a marina usually means there’s a bunch of work to be done. This is mostly because you’re at a dock with unlimited fresh water and shore power. Although here we’re not so lucky. The water on our dock has been turned off due to a broken pipe, and the power is all 220 V (European) with no converter option to the 110 V (American) that we need. Not too worry, Gregory is pretty much capable of jerry-rigging anything. 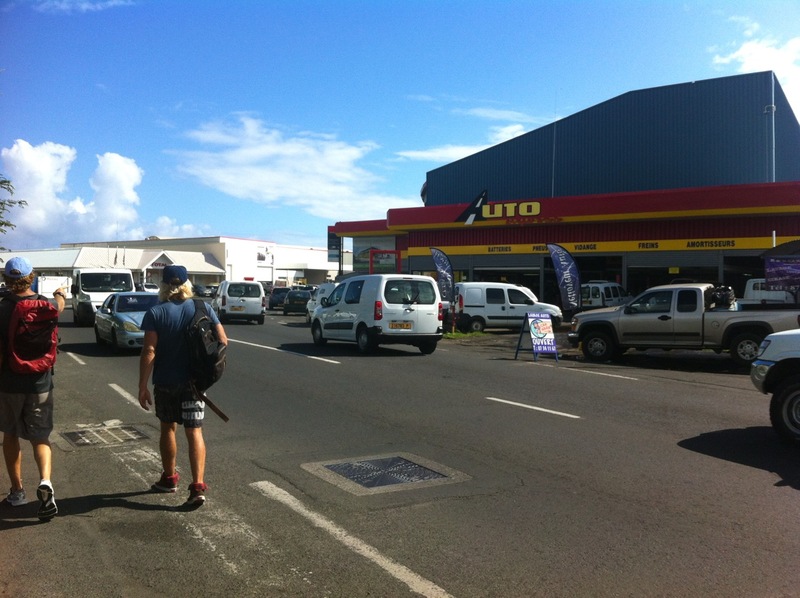 And what Papeete lacks in on-dock water and power, it more than makes up for in Hardware Stores. We completely agree with our friends cruising definition that states this life we lead is simply “boat maintenance in tropical destinations”, but what it lacks is mention of your worldwide tour of Hardware Stores. I grew up frequenting parts stores with my farmer-father, and besides piling up the bulk screws and nails in the hanging weigh scale, I always found the experience completely devoid of intrigue. And now I most admit, that the passing of decades and the changing of the store locale to half-way around the world, has done nothing to improve on the lacklustre affair of aimlessly roaming about aisles of solvents, fittings, and other entirely unstimulating items. Don’t get me wrong. I am completely resolved with the belief and knowledge that these trips are of the utmost importance. Though the little girl in me simply wishes Hardware Stores offered something more amusing than a dusty and drastically dated toy section. At least the Novey’s in Panama extended the happy distraction of free coffee and popcorn. In the true entertainment portion of the day, Gregory enjoyed a heavy dose of that which can not be planned. 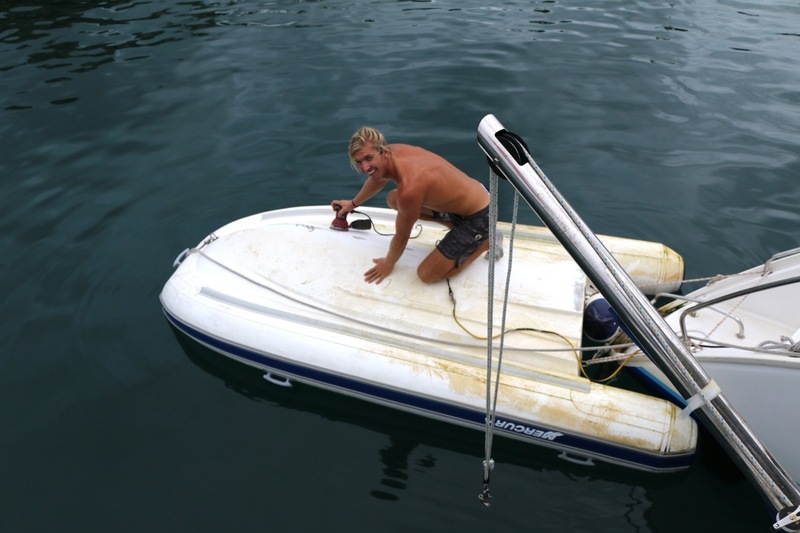 To clean the dinghy he had rowed it over to the forward dock in the marina, as that dock still had running water. This forward dock is about 6 feet from the raised town wharf that runs the length of the marina. This wharf, completely redone in very recent years, is very beautiful and offers a scenic walkway for the general public to stroll about. It’s construction consists of inlaid lights in smooth, polished concrete. A heavenly surface for rollerbladers and skateboarders alike. Although its uninterrupted plane from sturdy ground to air above water doesn’t give much safety to those of a more beginner level at the rolling sports. For when Gregory returned home from cleaning the dinghy he was stilling laughing about the poor kid who went sailing after his runaway skateboard off the wharf and into the salty, marina water below. Greg could barely believe his eyes as this all went down inches from where he was working. He stood shocked at the little gaffer splashed about trying to cling to his skateboard. Gregory said he reached down and plucked the boy from the water by his collar. Then, because only Gregory could make the necessary more hilarious, he motioned to the water hose that was still in his hand that he had been using to wash the dinghy. And there on the dock, Gregory hosed this unfortunate little child down head to toe as his Mother and older brother watched laughing from the wharf. On our Hardware Safari with Andy. Working away on Marie. Cleaning, sanding, and epoxying those holes. On his way back from the skateboarding entertainment on the forward dock. Quite the interesting way to row the dinghy.